Keston Hiura's regular season was so impressive that the top Milwaukee prospect would have been hard-pressed to improve upon it in his Arizona Fall League encore. Somehow, he's doing just that. Baseball's No. 30 overall prospect singled twice and drove in three runs, pushing his AFL-leading RBI total to 30 through 17 games played, nearly twice more than the next players on the list, as Peoria fell at Glendale, 9-5. 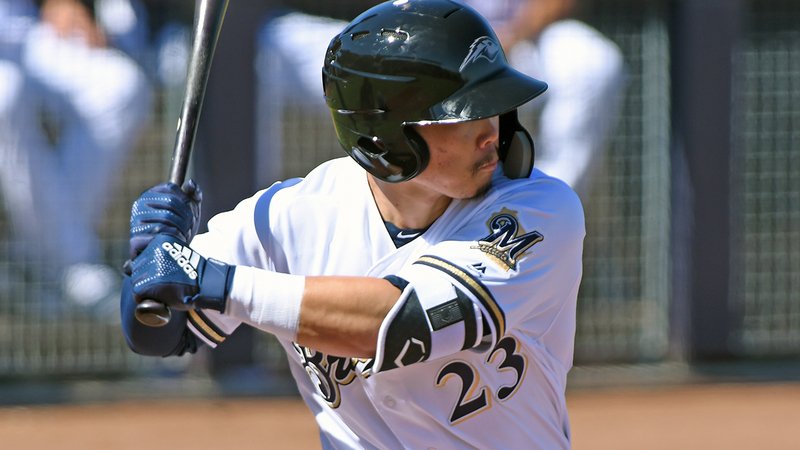 After his six-game hitting streak -- which featured four straight multi-hit games -- ended Friday, Hiura broke through in the fifth inning at Camelback Ranch. With two men in scoring position, the second baseman laced a single to center field that plated both. Two innings later, he roped another RBI single with the bases loaded. Through 17 games, Hiura is batting .352 (25-for-71) with four homers, three doubles and a triple. His 30 RBIs are the most on the circuit since 2011 when then-Texas prospect Mike Olt drove in 43 and Colorado's Nolan Arenado plated 33. Second-ranked Mets prospect Peter Alonso and No. 11 Rockies prospect Tyler Nevin stand tied for second with 17. Tampa Bay's No. 9 prospect Lucius Fox -- Hiura's middle infield partner -- tallied two singles out of the leadoff spot for the Javelinas. Mariners prospects Joe DeCarlo and Ian Miller also added a pair of hits apiece. Glendale pounded out 12 knocks in the victory. Cleveland's No. 6 prospect Yu Chang registered two, including a double, and drove in a run. Yankees No. 16 prospect Thairo Estrada, Steve Wilkerson (Orioles) and No. 4 White Sox prospect Luis Robert plated two apiece for the Desert Dogs.